For whatever reason, I've been having the patience and desire to try fun and interesting nail designs lately. I suppose since summer is right around the corner, I'm wanting to attempt bright, cheery, seasonal designs to jazz it up a bit. Plus, there's so much around that can spark creativity this time of year. I always say inspiration can come from anywhere so long as you keep your eyes open for opportunities. That's exactly what happened with this design. I'm currently sporting one that wasn't sought out, but rather I was going about my business eating watermelon when I experienced a surge of inspiration. 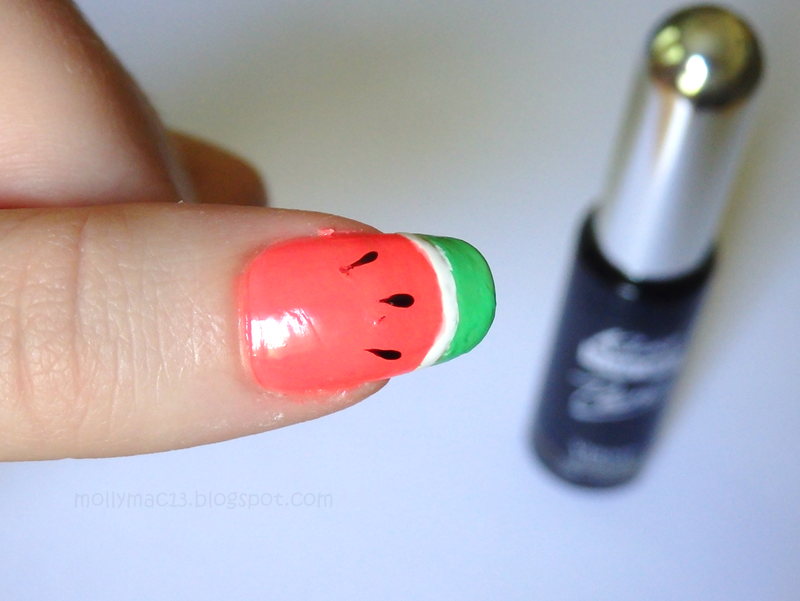 The result was me trying to paint my nails to resemble the fruit. I didn't have much time the night I was doing them, so I was only able to complete my thumb. If I had more time and the cheap nail polish I was using didn't take 5 billion coats to be frickin opaque then I would've done all of my nails. Oh well. I painted the rest white leaving my thumb as an "accent" nail. This design would look adorable on all of your nails, or even just an accent one on the ring finger. Definitely Instagram worthy! 2. 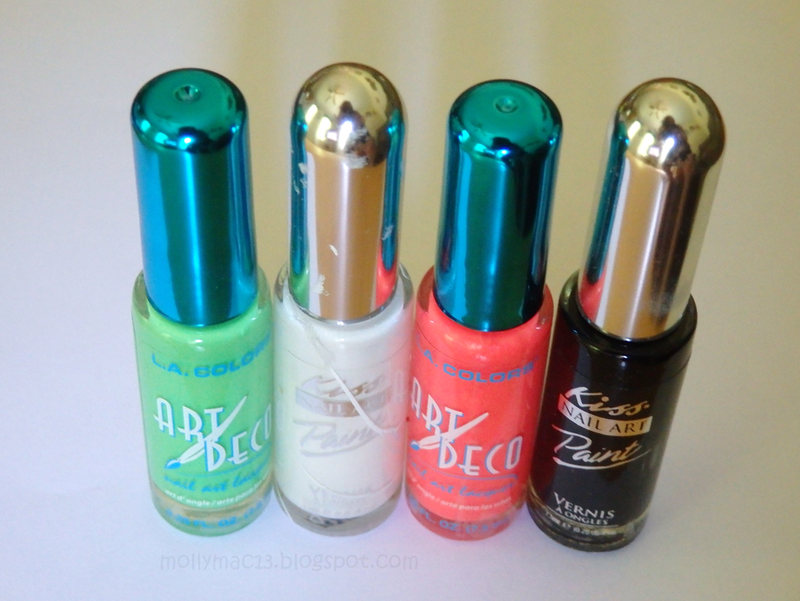 Apply the base coat to your nails to prevent staining. 3. With the green thin tip polish, paint your nails as if you're doing half the width of a french tip. This will end up being about two strokes wide. 4. Apply one line of the white polish below the green. 5. 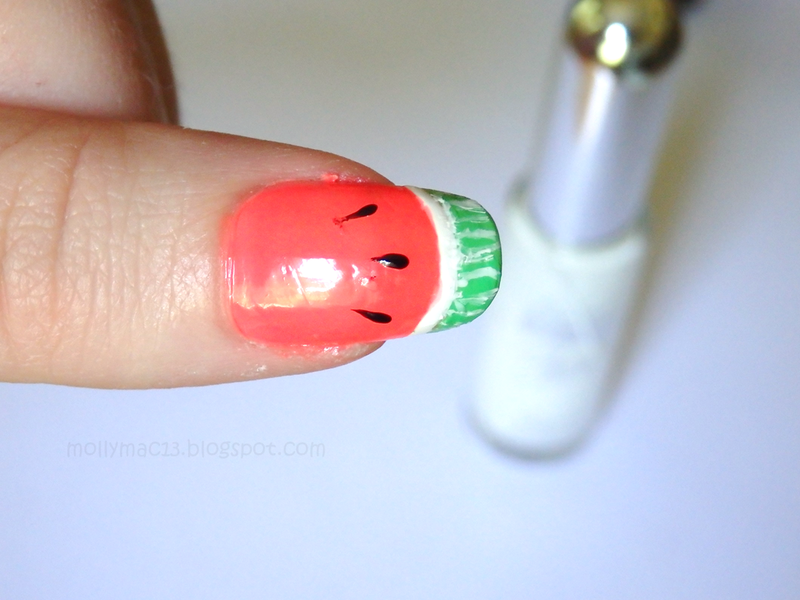 Fill in the rest of your nail with the red/pink color. 6. Add 3 black tear drop shapes on the red slightly below the white line, the point of the drop facing towards your cuticle. 7. 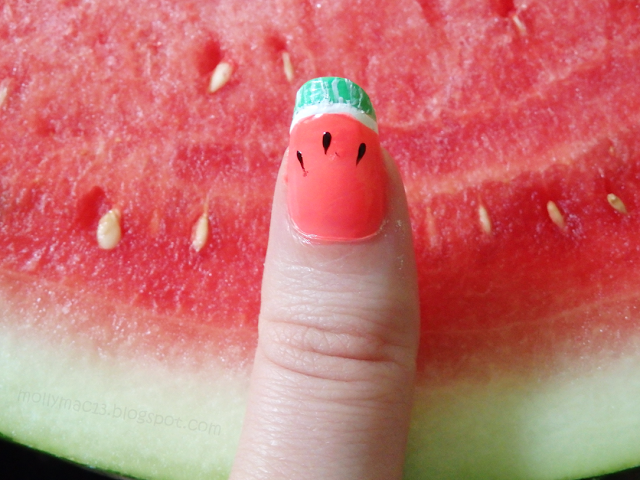 With the white, add several very superficial strokes to the green to match the pattern of a watermelon. Use a feathering stroke. 8. 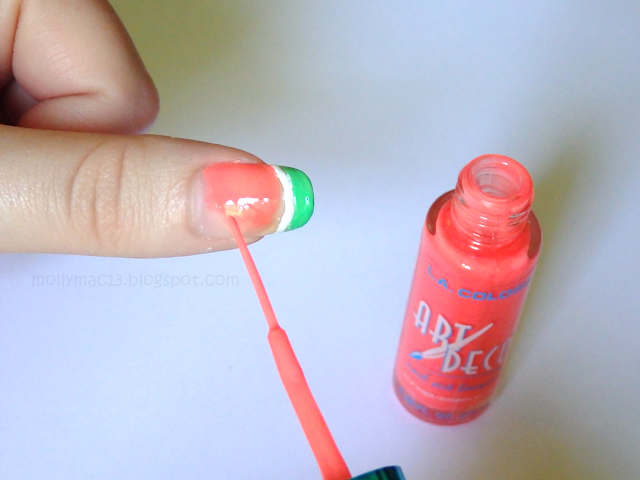 Apply a top coat to complete this design! If you try this design out, use quality polishes so you don't run into the same problem as I did Be sure to post a picture of it on Instagram and mention me (@molly_mac3) so I can see it! How cute! I love this design. You did a wonderful job. Such a lovely idea! I love watermelons! Really nice work honey, looks great!